In this presentation we wanted to see what kind of structure we could make while moving in a set up that is similar to . The structure we ended up using was that of a daily schedule or calendar. Thomas repetitively goes up to the microphone to announce a certain time of the day and an activity or event, for example: two thirty, I'm running late or 4 o'clock, an important meeting. To each of these announcements a certain dance movement is assigned. 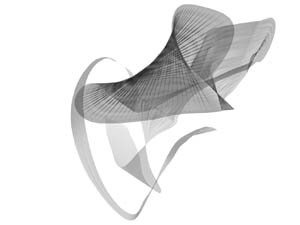 The movements are not reflecting the activity in a mimic way but rather revealing some obscure aspect or abstract impression of the activity. Once established and put together the vocally spoken and physically danced gestures become easily recognizable. As an audience you hear the event Thomas announces and then see the corresponding movement from the morning until the night. 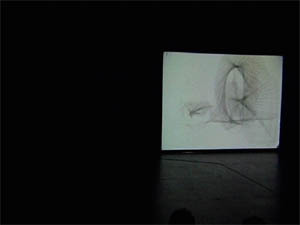 Only now, when Thomas starts again from the morning, repeating both the announcements as well as the movements exactly as he has done before, his traces on the projection slowly become visible. Slowly the stage lights on Thomas fade out. 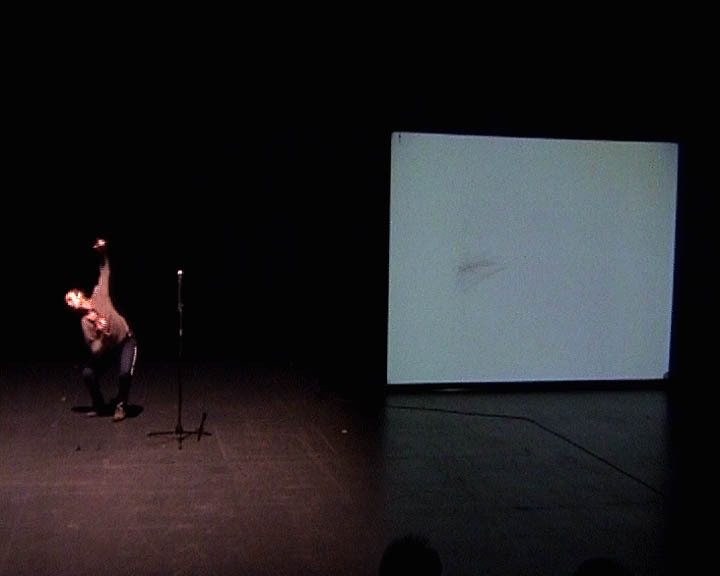 What the audience sees is the projection with Thomas' traces as well as hearing his spoken text. How much does this projection remind people of the movements from before? Does it express some other aspect of the activity? Does one's own daily routine come to mind, completely unrelated to the movement seen before? It was our conscious decision to present the choreography danced by the human body first by itself, separate from the movement traces, shown later. 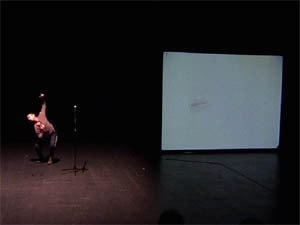 Only during a short time halfway through the performance the two representations are seen at the same time. That way the observers are challenged to put the two representations together in their minds using their memory. One imagines and remembers the missing half. As in an imaginary line between the two hands leaves a motion trace. 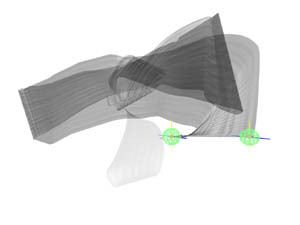 The distance between the two hands determines the width of the transparent trace. For the first part of the performance the trace-projection is not visible. 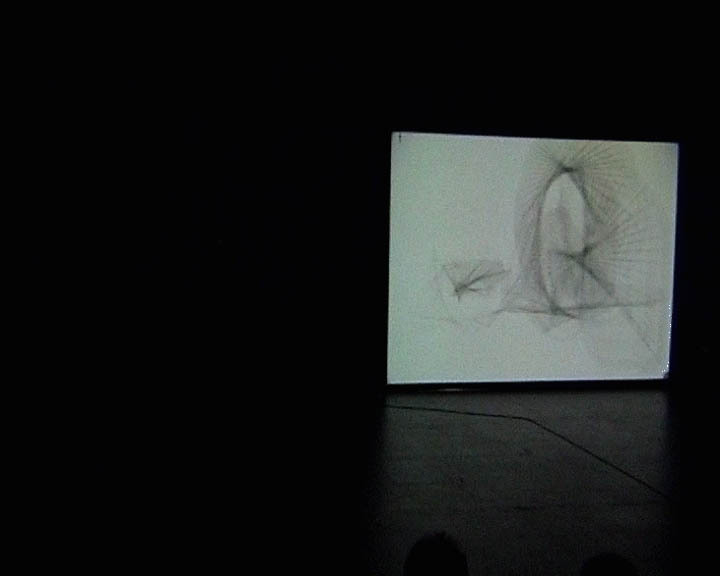 Later, as the stage light slowly fades out, the dancer gets less visible and at the same time his traces on the projection become more visible. Nearly the same technical setup as in . The two Sensors are attached to the dancer's hands. The computer reads the realtime data from the sensors and stores their positions for the last frames. A visual plane is constructed out of these positions by connecting the line segments defined by each pair of positions in a chronological order. At the beginning the trace is completely transparent. A press on the RF button triggers a slow fade-in of the trace. The fade-in time is approximately. 1 min..